I've come across several beautiful book covers lately that feature silhouettes. I find it interesting that the covers have such similar styles and the books are all from different genres. We have a biography, a historical fiction, and a fantasy (albeit: historical fantasy... is that a genre?). 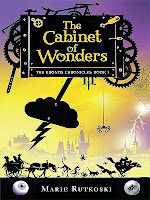 And then I started thinking and, though it's a bit different, you could add The Cabinet of Wonders by Marie Rutkoski to this list. New trend? Perhaps... Who's got other examples? The Manny Files, The Penderwicks, Highway Cats... I think it's definitely a trend. Some of these must have been created by the some illustrators, but I'm not sure which. I am very curious to know if these are all by the same illustrator. I'm thinking that it is not good for marketing purposes to have books (in different genres by different authors) to have similar book covers. However, I do like the silhouette images. I like the old time look of the books.